Bell rings after 30yrs silence. Seagoe Bell rings out for Easter Day for the first time in over 30yrs. The total cost of the restoration was approx £170,000. A grants towards the some of the costs was gratefully received from the Herritage Lottery Fund. Seagoe Parish has a very important and extensive archive dating back to the 1600s, and the magazines are but one part of this. An exciting opportunity to lead Seagoe Youth Group’s ministry in the wider Seagoe area, in particular following last week’s announcement that we have been successful in our application for a grant to have the current youth centre at Killicomaine redeveloped. Please share with anyone who might know of someone interested in this post. Seagoe Youth Group seeks to appoint a Leader in Charge. The Leader will have responsibility for the development of the Group’s youth work programme, in line with Education Authority priorities. The closing date for applications is 18th June 2018 at noon. Wednesday 23 August 2017We are delighted to welcome Jim Flemming as our Outreach Worker and Church Planter. Jim, originally from Willowfield Parish Belfast, commenced with us at the start of August. Jim will primarily focus on the Killicomain area of the Parish. Rev. 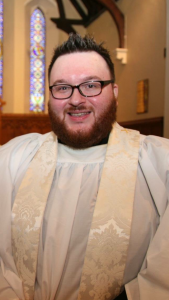 Stuart Moles will be ordained Presbyter (Priest) on Sunday 27th August at 4.00pm in Down Cathedral, and will then join the Parish staff the next day. Everyone is encouraged to attend Stuart’s ordination. Stuart is from Shankill Parish, Lurgan and before training for the ordained ministry worked as a Youth Worker in Ballybeen Parish, Dundonald. Stuart will have a particular emphasis on the development of our ministry to children, young people and young families. Rev. Raj Sathyaraj, who has been working with us as Curate for the past 6 years will take up a new half–time post from September for one year. Raj will focus in particular on the development of our ministry to more senior people. Please pray for this new ministry team that we we will be equipped and guided by God’s Holy Spirit as we seek to enable the Church to develop its ministry. We are delighted that one of our youth workers, Josh Thornbury, who previously worked with the Simon Community will be speaking at our 9am and 10.30am services on the work of The Simon Community. Following the main service, at about noon, everyone is invited to a fund-raising lunch in the Parish Centre for the work of Simon Community. Please spread the word and bring others along with you. 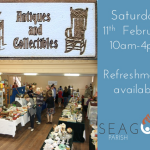 Antiques and Collectibles Fair to be held on Saturday 11th February from 10am-4pm in Seagoe Parish Centre. Last year’s fair was excellent and this year is shaping up to be even better. 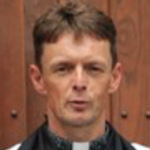 We are delighted to welcome Revd. Geoffrey Hamilton as our new Intern Deacon for the coming year. Geoff will serve in Seagoe whilst continuing his studies in Dublin at the Church of Ireland Theological Institute. Sunday 26th June 2016 is the closest Sunday to the 200th Anniversary of the Consecration of the current Church building for worship, the Consecration having been on 28th June 1816. All of our services will take the form of a thanksgiving for the past and a looking to the future. 10.30am is the time of the main morning service and the evening service will be at 6.00pm in St. Patrick’s, at which the Bishop will preach. We are delighted that the National Museum of Ireland are granting us the privilege of having the Seagoe Bell on display which dates from approx 900ad. There will also be a display of items from the Parish Acrhives, which date from the 1600s. The display will open to visitors from Wednesday 22nd to Tuesday 28th June from 2pm to 4pm and 7-9pm. While in command of 9th (Service) Battalion, Princess Victoria’s (Royal Irish Fusiliers), Lieutenant Colonel Stewart Blacker wrote to his wife, Eva, almost every day. 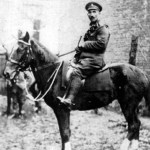 The letters were relatively uncensored and provide a fascinating insight into the life of a commanding officer in the front line and of the actions of his Battalion. 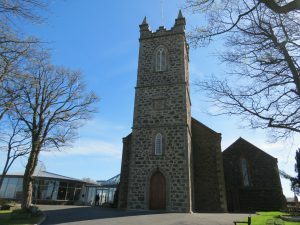 Between 1921 and 1924 extracts from his letters were reproduced in the magazine of Seagoe Parish Church, Portadown in chapters titled ‘With The ‘Ninth’ In France‘.